BBQ and bacon… We couldn’t resist the first batch of barbecue chicken and bacon skewers, so we had to make a second batch and sample them again, just to make sure the recipe was completely right. They were simply too mouthwatering to photograph the first time around, but now we are confident that you will devour them too. Fire up the grill, chop up those chicken breasts, thread them on the wooden skewers (please, don’t forget the bacon! ), cook up that homemade BBQ sauce to the best of your ability and get ready for some amazing bites. While you are at it, make that a double batch of barbecue sauce, so you can grill again later in the week, as this meal is very repeatable. An appreciable thing about skewers is that they are fun for all ages – and you can even add some seasonal vegetables from your garden (or from someone else’s garden) too. Thread the meat and veggies on the same skewer, or keep them separate, but always remember that grilled vegetables taste wonderful when slathered with BBQ sauce – see the real reason you might want to cook up a larger amount? If you are cooking for a crowd, more than 6 people in our book, an informal meal with skewers is a great way to ensure that everyone gets what they like to eat. Asian-balsamic steak skewers, mushroom skewers, or even grilled fruit skewers with melted chocolate – the combinations are endless. In a bowl combine the paprika, garlic and onion powder, then season to taste. Thread the chicken pieces and bacon, alternating, onto skewers, folding the bacon pieces in two. Season the skewers with the spice mixture. Place the skewers on the preheated grill and grill 4 to 5 minutes per side, or until nearly cooked through. 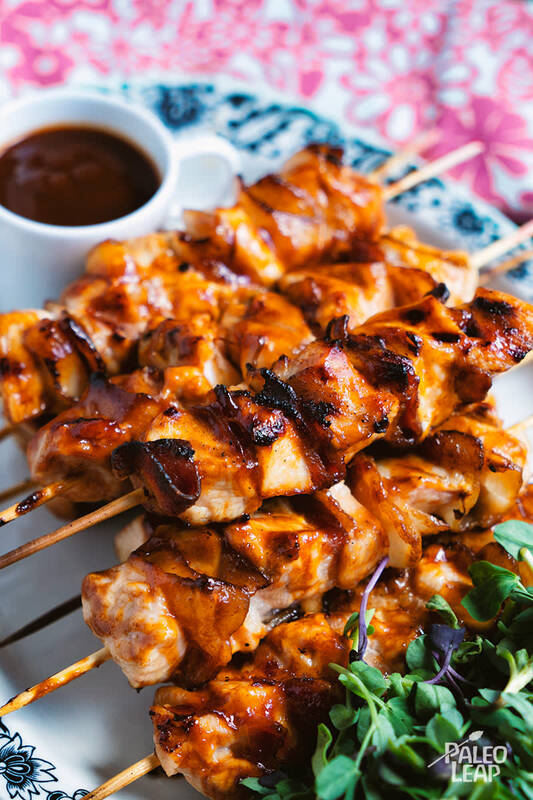 Brush the skewers with the BBQ sauce generously, and continue cooking 1 to 2 minutes per side, or until fully cooked. Adjust the seasoning and serve with extra BBQ sauce.